COMMON NAMES: Amapolas del campo, Bermuda Thistle, Bird-in-the-bush, Brahmadanti, Cardo Santo, Caruancho, Chadron, Flowering Thistle, Gamboge Thistle, Gold Thistle of Peru, Hierba Loca, Jamaican Thistle, Kawinchu, Mexican Prickly Poppy, Mexican Thistle, Mexican Thorn Poppy, Prickly Pepper, Prickly Poppy, Queen Thistle, Satayanasi, Shate, Svarnasiri, Thistle-bush, xate, Yellow Thistle, Zebe Dragon. This is a plant that not only produces a large number of seeds (just like Papaver somniferum), but they are easy to sprout as well. The seeds look very similar to culinary poppy seeds that most are familiar with, but they are about twice the size. Simply scatter these on a flowerbed during the spring, and you will have a fast-growing garden that sprouts in a week or two at most. The soil doesn’t have to be anything in particular, although Prickly Poppy does seem to prefer lighter, sandier soil. And the climate; this plants easily adapts to various climates as well. From personal experience, this plant grows in a very similar fashion to Wormwood (Artemesia absinthium) in many ways. Wormwood almost grows a like a weed, and although it likes warmer climates, it thrives throughout the growing months in places that see snow cover as well, growing the next season on its own from the miniscule seeds it drops at the end of the summer. Its favorite climates are tropical in nature, although when it’s in a warm, sunny environment, dry air doesn’t seem to bother it one little bit. The plant produces a yellowish latex that is very similar in appearance to the narcotic poppy. It’s a milky sap that can be collected and dried, and we have seen this latex from a private farm in Arizona appear for sale at Shaman’s Garden from May to about September, but the supply is always limited. It is well documented that this was an extraordinarily important plant for the Aztecs. Prickly Poppy was “nourishment of the dead” as it would be offered to the gods during sacrifices. 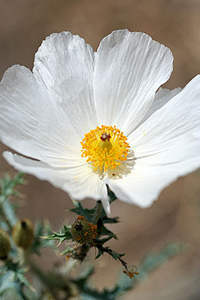 Outside of that, reports of Prickly Poppy are interspersed throughout history, but it became cemented in culture and infamy when Chinese residents in Mexico manufactured a product from the latex produced by this plant that was reportedly similar in effects as opium (Papaver somniferum). There is little documented evidence that regarding the psychoactive properties of this plant, although there are two important and reliable reports. First, in India (one of the places this plant is common to) it is called pharamgi dhattura specifically because of its psychoactive properties. Secondly, there are numerous accounts of the freshly dried leaves being smoked as a Marijuana (Cannabis) substitute. There is even scattered evidence that Argemone mexicana has been used as an aphrodisiac, but no solid evidence has been found to support this use. TRADITIONAL USES: As mentioned earlier, this plant was used as “nourishment for the dead” by the Aztecs. They would collect the latex from this plant and make it into a thick, pliable material, similar in texture to the toy known as “Silly Putty” which was a huge fad in the 1970’s. The pliable material would then be fashioned into an image of the “Top Dog” god of the Aztecs known as Huitzilopochtli. The other two plants that are associated with and held sacred by Tláloc are Artemisia mexicana and Tagetes lucida. Tagetes lucida has been the subject of many debates; some claim that the plant is nothing more than a “scam” plant with no effects whatsoever, while others swear by it as a visionary plant on its own, or when made into a smoking blend with Prickly Poppy. Most-likely, it’s the quality of the material being smoked, and not the plant itself. Historically, though, there is a great deal of evidence supporting the belief that along with Argemone mexicana, Tagetes lucida has distinct psychoactive properties. TRADITIONAL PREPARATION: The leaves are simply typically smoked or made into a tea, with an accompanying cigarette, much like Calea Zacatechichi, the famous Dreaming Herb is used. The seeds have been ground and added to smoking mixtures as well, not only as a potentiator, but for its own distinct effects. When available, the latex is also smoked, just like other Plant Resins discussed at the website of the same name. Prickly Poppy is typically regarded as a sedative, but its visionary and psychoactive properties are just now being explored. This plant is, as of this writing, legal throughout the world, and there is much research and personal research that needs to be done to explore and verify what is mostly anecdotal evidence at the moment. If you have any personal experience whatsoever with this plant, if you know of online venders who carry the latex other than the ones mentioned above, please feel free to e-mail me at the address below. TRADITIONAL EFFECTS: Author Bep Oliver-Bever in “Medicinal Plants in Tropical West Africa”, says this in regards to Prickly Poppy; “The seeds have a cannabis-like effect and the herb, juice, and flowers are reputed to be narcotic in many countries.” We have many friends in Mexico who have personal experience with this plant, and say that the effects from smoking the dried herb are far from subtle, offering not only euphorant effects, but aphrodisiacal ones as well. Although the dried leaves are typically the only parts of the plant available through various entheogen and ethnobotanical dealers, we are starting to see more and more seeds offered as word of this plant spreads. Unless you grow your own Prickly Poppy plants, the latex is next to impossible to find, but the collected latex, which is then dried into a tarry resin, reportedly has potent narcotic effects. Aregemone mexicana also contains isoquinoline alkaloids. The effects and possible uses of isoquinolines, a compound found in many plants, including cactus and poppies, have still yet to be fully explored. Used commonly in Chinese medicine, there is now a great debate amongst chemists as to whether or not isoquinolines contain or contain the potential for psychoactive effects, a concern into which much research is finally being directed. 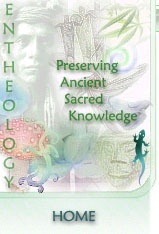 Mapacho is considered very sacred by Amazonian shamans and is employed alone (by tabaqueros) or in combination with other plants in shamanic practices. Article concerning the use of Solandra among the Huichol and the true identity of Kieri. IMPORTANT: We provide all information for educational purposes only, and endorse or recommend nothing here. A special thanks to Keith for all his support and insight.